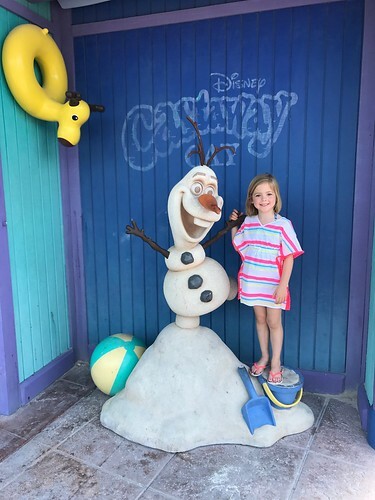 Posted in Family	by Kendra G.
Kenley is five and a half! 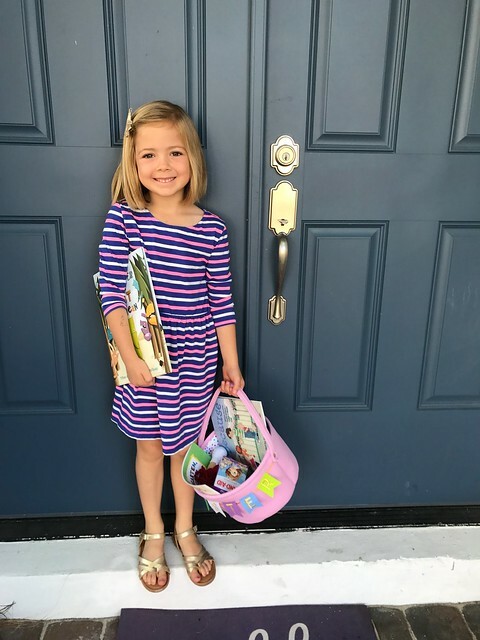 She continues to thrive in school and VPK. 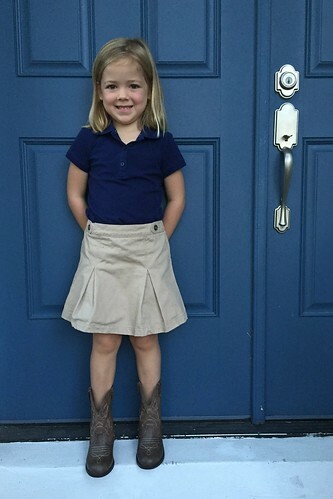 We are rounding out the end of the year in just over a month then she will officially be a kindergartner. Registration and orientation at her new school are just a couple weeks away. While she is thrilled, it’s going to be an adjustment for me. They’ve been talking about going to kindergarten a lot at school. Her teachers encourage drop off at the door to help start the transition and her class has been eating lunch in the cafeteria, rather than in their classroom. Each little thing she tells me, I get tears in my eyes. We also have been reading Kindergarten, Here I Come and The Night Before Kindergarten. Both of the books are super cute and I highly recommend them. She rarely takes a nap anymore at school, but will still take nap at home if she’s tired enough. 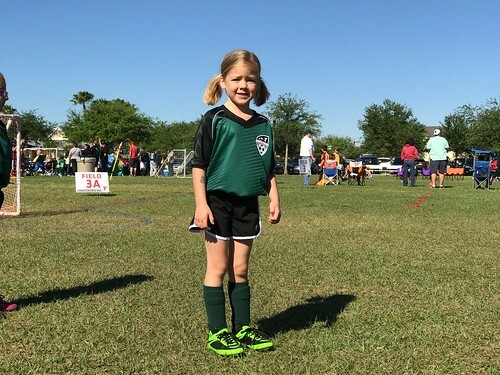 Outside of school, she’s currently playing soccer. This is her fifth season! I can’t believe that it’s already been two years since her very first season. She is playing with the same team that she played with in the fall and it’s been a really fun season so far. Once soccer is over, we’re considering starting basketball or gymnastics in the summer. If you ask her, it will be gymnastics. She loves to be outdoors, ride her bike (without training wheels! ), and swim in the pool. Crosby Martin is three years old today! This boy is the perfect mix of sweet and ornery. He sure went out with a bang on these terrible twos. The past couple of weeks it seems that he has lost his listening ears many times, but when he’s not causing trouble, he is just a sweet boy. He loves to cuddle and give hugs (many times to complete strangers). He is fun-loving and is absolutely hilarious. The morning after we went to Legoland he came straight into our room from his room (at 7:30am, I might add) and started singing “Everything is awesome!“. Not only did we think it was hilarious and awesome, he sure did too. Crosby is an active little boy. He loves to run and jump. You can always find him jumping on the couch, from the couch to the ottoman, on the trampoline, from his bed to the floor, and anywhere he can get some air. I love this picture because I feel it perfectly captures him at this age. Climbing and hanging on something, then jumping right off. Without fail, every single day we threaten him with “do you want to go to the hospital today?” The answer is always “no” and it usually causes him to stop doing whatever it is for a brief moment. Whenever he puts on his tennis shoes, he says he’s going to go “run really fast” and he does. He sure has a lot of energy! He’s doing very well in school and is learning so much! He’s been practicing his days of the week and months of the year thanks to special songs during circle time. He knows exactly when his birthday is and does a great job with his letters. He is getting better with his counting and can usually make it to 20 with no problems. His speech is not nearly as clear as Kenley’s was at this age and he still has a lisp, but overall his speech is very good. I wanted to continue with the tradition from Kenley’s third birthday, so I asked Crosby the same questions in a little interview. It’s funny to see their answers side by side. We also read Kenley’s answers back to her this week and she thought they were hilarious. 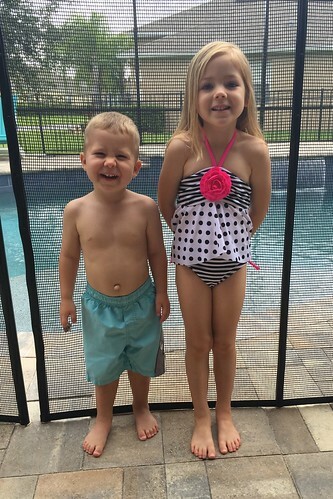 I love that he absolutely adores his sister, even though he loves to torment her most days. I am also not surprised that “poopy” came up in his interview because he talks about this daily. He thinks it’s hilarious. We don’t. Their class has a parade on Monday and they all got to choose which community helpers to be. Crosby, of course, chose sanitation worker, so we got him a cute little yellow vest. He loves garbage trucks! Happy birthday C-man! We love you so much! Crosby’s amazing photos are by Dearly Photography! I can’t wait to share the rest! Kenley Dee is five years old today! I can’t believe how old that sounds! Five seems like a whole new ballgame and I am excited to see what this year holds for her. 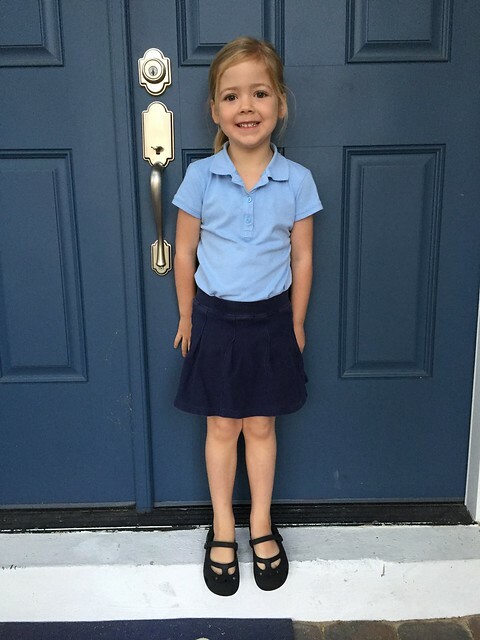 Kenley started VPK (voluntary pre-kindergarten) in August at her same school. 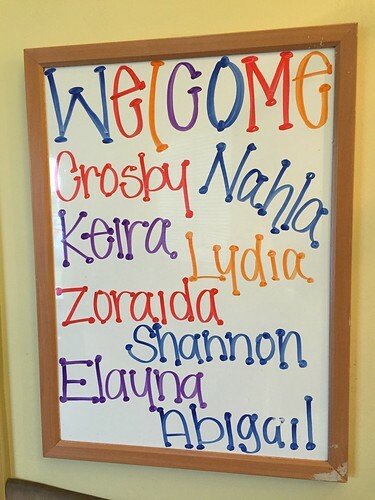 She has a new teacher, who we love, and has a lot of her old friends in her class again. During the week, they rotate between music class, PE, and art class one day a week and she has French two days a week. They are continuing with a letter of the week, but have also started sight words and other activities that introduce reading. Kenley does very well writing her name and all of our names using both lower and upper case letters. She loves practicing her writing and asks us to spell out words for her to write. 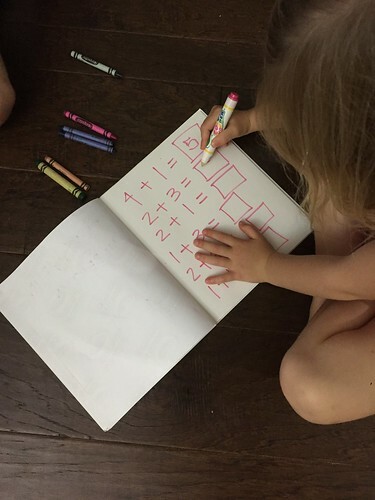 She also has started working on math. She will have me write out simple addition problems and she fills in the box. Sometimes she will grab a handful of crayons so she can pull out five, then two, and count them all together to make seven. It’s super cute! Thankfully, we haven’t had much homework this year because I am sure we’ll get plenty next year when she starts kindergarten. We continued the birthday interview tradition, so you can learn more about what she likes straight from her! Here are her answers from her fourth birthday. My favorite thing about the interview is that last year she said broccoli was her favorite food and this year it’s ice cream. SO true. She is still a great eater and usually goes for her veggies first, but she’s definitely becoming more opinionated about what we have for dinner. There will be nights that she will go without dinner because she “doesn’t like it” but she will eat the exact same meal the next week with no complaints. Kenley is slowly dropping her midday nap. On school days, we usually get the report that she lays quietly or does a quiet activity. On the weekends, it depends on how much we do or have planned for the day. She can definitely take a nap if we want her to, but that also means that she will go to bed a little later that night. She goes to bed around 8pm each night and gets up by 6:30am each day, no matter what time she goes to bed. She is definitely a creature of habit. Kenley Dee, you are bright, energetic, and have a big heart. C-man is just two short months away from turning three! I will spare you all the reasons how this is entirely not possible, but we’re almost there. 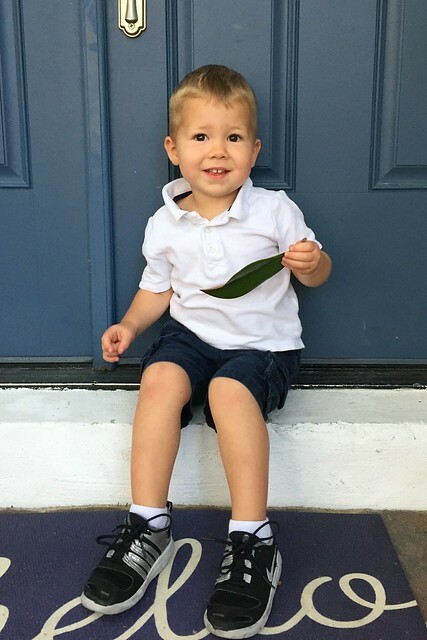 The big news this month is that Crosby started preschool! 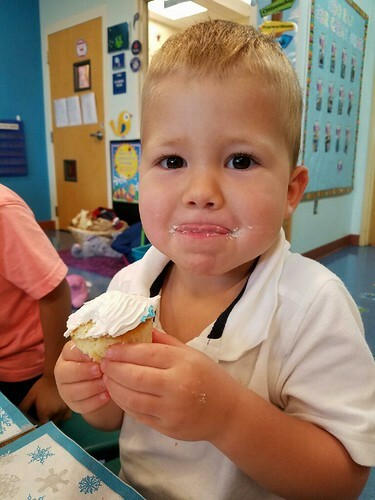 I was a little surprised that he moved up this year since Kenley did two years in the toddler hall and just moved to preschool last year. 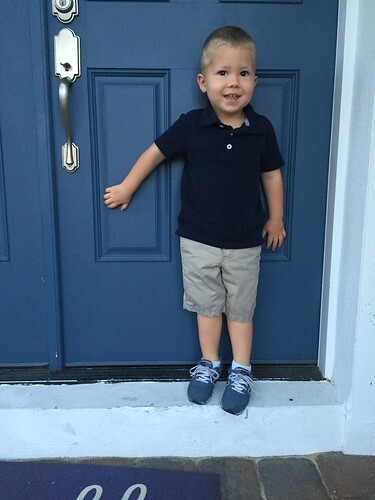 Crosby will do two years of preschool before starting VPK. I am already thrilled that he moved up as he is doing so well in his new classroom. It’s also fun that he and Kenley are in the same morning care room together now since he’s in the preschool hall. He’s been so excited about school, each morning we get to school he asks someone different if they like his new backpack, which is actually not new since he had the same one last year. It’s really funny how opposite Kenley and Crosby are in many aspects. Kenley is such a morning person and hops right out of bed when her green light comes on. Crosby is the complete opposite. During the week of Gilbo Camp when the kids didn’t have school, he slept until 7:15-7:30 am almost every day. That may not seem late, but we are in the car by that time on a normal school day. He would even wake up, see his sun was on, and roll over to put his covers back on. I kept telling him that he was in for a rude awakening once school started and he sure was. He does not like to be woken up and he is not a morning person whatsoever. Kenley is just like her daddy and Crosby is just like his mommy. Overall, he’s a great sleeper. He’s doing a much better job at bedtime and does get out of his bed a couple of times to “go potty” or see what we’re doing. Most nights he’s in bed for good by 8:00 pm. He’s been doing a great job of staying dry all night and has been accident free for a while. We take him to potty when we go to bed between 10-10:30 pm and he doesn’t mind at all. Most nights he’s barely even awake. Crosby is getting so old and becoming such a little boy. He is such a lover and a cuddler. His teacher mentioned how cuddly he was after just the first day. He loves babies and loves on them so sweetly each time he sees one. He’s such a sweetheart. He also loves his sister. He hangs on every word she says and repeats everything that comes out of her mouth, which is not always a good thing. 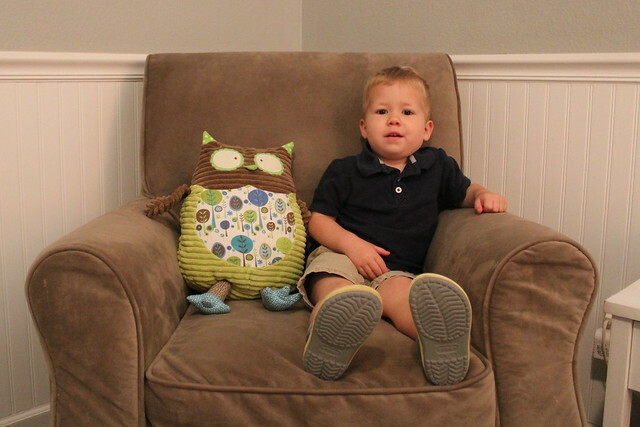 We are really looking forward to a fun October and celebrating this guy’s third birthday! Crosby is 32 months today and quickly becoming a little boy well on his way to three years old. Where did my baby go? In the last couple of months he has changed so much. For starters, he is completely potty trained. I mentioned in his last update that we had just started the three day potty training method with him and he was doing well. To be honest, he completely surprised us! “They” say boys are harder to potty train than girls but that is completely untrue. I don’t know the reason but I honestly think he did better than Kenley did. He was back at school on day 4 of potty training and hasn’t worn a diaper or a pull-up since we began the process, both day and night. That’s not to say he didn’t have some accidents both at school and during the night, but we rarely worry about him now. He does a great job of telling us when he needs to go. We (mostly Greg) will take him potty in the middle of the night and he will go most nights without a fuss. We are so proud of him! His teacher also commented on what a big boy he has become since he has been using the potty. It’s like he flipped a switched and has lost all of the toddler in him. His communication has really improved too. Aside from his occasional overly excited stutter, he is speaking more and more clearly, as well as holding actual conversations. A lot of our deep conversations come while he is going poopy before bed. He says the funniest things! Earlier this month, school ended and he transitioned out of his toddler classroom and into his summer camp room. He’s had two weeks of summer camp and they have been great weeks. 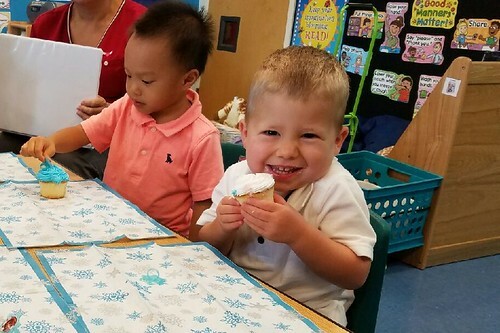 It’s always hard to gauge how the transition will go but he’s done very well, especially considering that a couple of his friends were moved up to preschool, so he has a lot of new faces in his current classroom. He has very specific interests right now. He loves sharks and he LOVES A Hole in the Bottom of the Sea. He was introduced to the video at school and asks to watch it every single day when he arrives to school. He loves singing the song and he loves the shark in it. He will carry around his stuffed shark that he sleeps with and make it “swim” through the air while he sings. He also loves his Nemo fish and will typically sleep with him too. 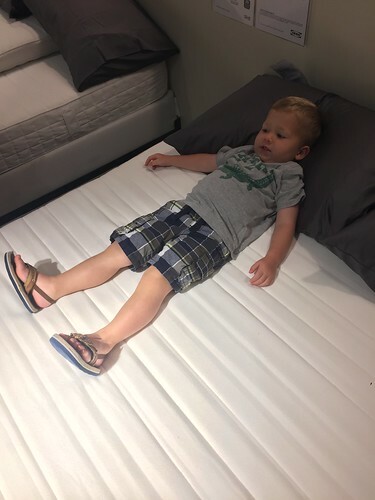 Crosby now sleeps in a twin bed and we are officially done with our toddler bed. His new bed is shaped like a boat and we’ve had it since he was a baby, so Greg and I were equally as excited to move him into it. We rearranged his room since the bed is so much bigger and it looks so great. I will post updated pictures of his room soon. He does a good job sleeping, but it takes him a while to wind down at the end of the day. There have been a couple nights over the past few weeks where he has gone to sleep later than Kenley. Thankfully, he will sleep until 7am or after if he stays up later than normal, whereas Kenley gets up at 6:30am no matter what time she goes to sleep. I have a feeling he will be done napping when Kenley is done napping, which I hope is not for another year! Diapers – No more diapers! Size 2T/3T undies! Dislikes – Seeing mommy and daddy upset with him or sad, staying in his bed & hot stoves. It’s Crosby’s half birthday and he is officially two and a half years old! This concludes the month of half birthdays for our family. April is almost as exciting as October. We celebrate the kids’ half birthdays with a donut to have something exciting happening in the spring since all of the real fun happens in the fall. Sometimes, it’s the little things. Crosby has a lot of updates this month! 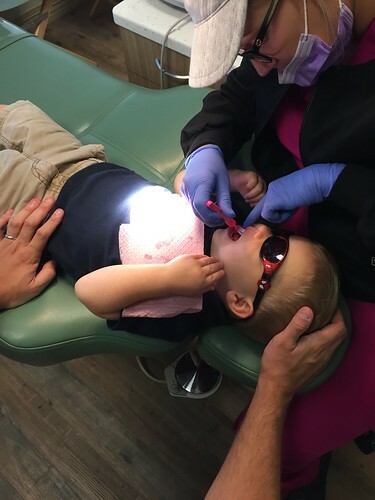 This month was his first trip to the dentist! Kenley didn’t go until she was three years old and really didn’t like it at all, so I wanted to start Crosby sooner with the hopes that he doesn’t think much of it. It also helped that his big sister was there too. To be honest, he could care less about it and did a great job! Since he was a first-timer, he got his name on the board! 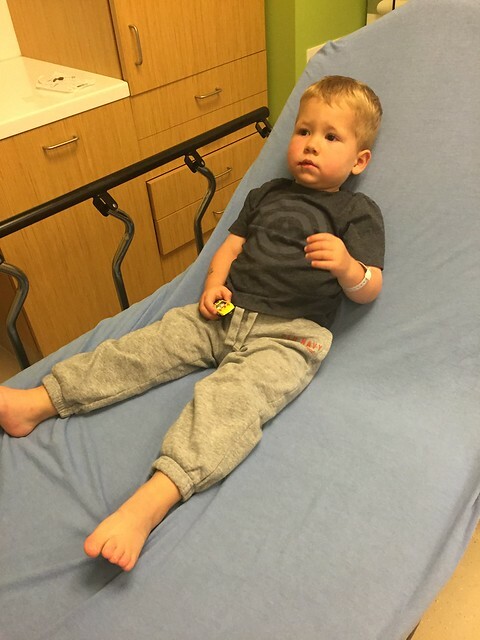 Another first this month was our trip to the ER a couple weeks ago. As I was arriving at school to pick up the kids on Thursday evening, he was playing on the playground and had a mishap with the slide. His bottom canine tooth went straight up into his top lip very close to the crease. As soon as I saw it, I knew it needed stitches and I do not do well with things like this. Of course, Greg was at work too, so we all headed to urgent care to see what they could do. Turns out, not much. After thinking everything through, I ended up going back to the house to change out of my heels and suit jacket and to put Crosby in some comfy clothes. I dropped Kenley off at Kyler’s house and Crosby and I were on our way to the ER. He ended up getting called back around 7:45pm, right at his bedtime. I’ll spare you the details, but he did awesome and I did horrible. I had to sit down because I was about to pass out. He got three stitches in his lip and one dissolving stitch on the inside of his cheek. He was limited to bland, soft foods for the week and no straw or sippy cup which was actually the hardest part. The stitches were removed on the following Wednesday and we celebrated at Tijuana Flats. Another awesome update is that we have completed the three day potty training boot camp! We are huge fans of the three day potty training method and we started on Saturday. 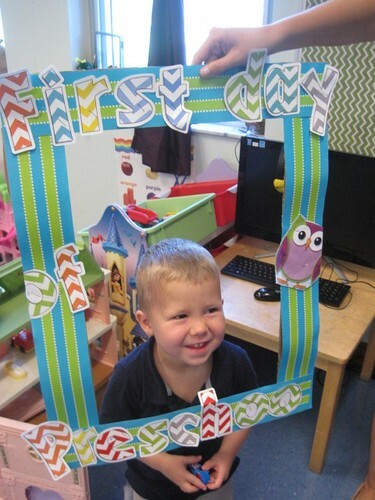 Crosby went back to school yesterday and had a great day. I will have a longer update next month after we have been at it for longer, but overall, I am very impressed with how quickly he’s picked it up. Other than those big updates, it’s been normal two year old stuff around here. Hair – Light brown and needs a haircut! Teeth – 18! His two bottom molars came through this month, and his top two are not far behind. Diapers – He was in size 5 disposables during the day and size 6 at night, but now he is only wearing his big boy undies! Hooray! Likes – ALL of the cars, trains, planes, construction vehicles, trucks, car loaders, anything that moves; Jake Legos; reading books; singing songs; running; chasing and being silly with his sister; really, anything his sister does; riding his balance bike; playing with friends; watching Disney Junior; seeing the animals at Animal Kingdom Lodge; getting an M&M for going in the potty; swimming and playing with the water table; his baby froggie. Dislikes – Pooping on the potty; waking up in the morning; getting dropped off at school; getting into trouble; time-outs. Happy half birthday little man! Today is Kenley’s half birthday and just like that, we have a four and a half year old. This girl is growing so fast. 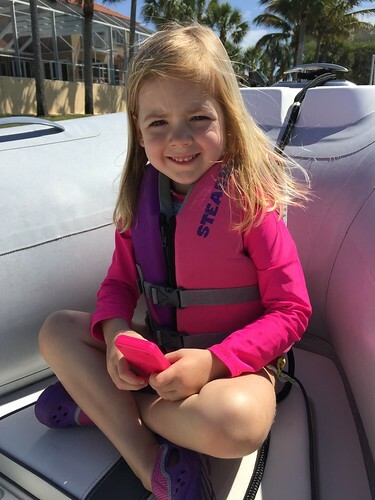 I had to go back and read her post from her 4th birthday and I can safely say that age 4 has been our favorite so far… which I am sure I will keep saying, but the first six months of 4 have been so different than age 3. She seems so much older than four and a half on most days, just by what she says and the things she asks. Greg and I are usually stumped or frustrated that we have trouble explaining what a word or concept means to her because we have never thought about it before. It is also very hard to explain what a word means without actually saying that word. She is very inquisitive. 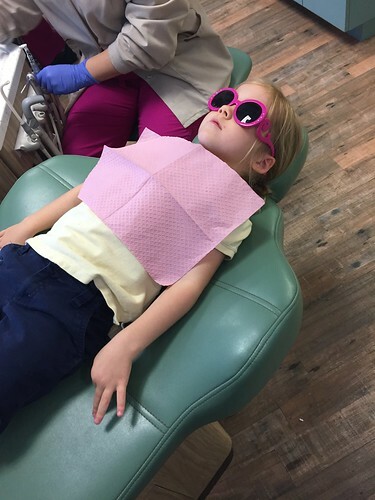 Kenley visited the dentist this month and needed several pep talks leading up to the big day. This was her third visit and she hadn’t been thrilled about the first two visits, so she had it in her mind that it was going to be terrible. However, I was pretty concerned about a tooth, so I stressed the importance of her getting x-rays done and getting a good cleaning. At her appointment six months ago, the dentist mentioned two of her teeth that we needed to keep an eye on and she was right…both of them already had cavities this time. As I sat there feeling like a failure of a parent, she said the both teeth were doomed from the beginning just by the way they were shaped, so there was nothing we could have done about it. Kenley will have both of them filled on two separate occasions, which is a bummer, but they aren’t painful now so we will avoid that by getting them done. The good news is that Kenley has asked to go back to the dentist several times since we’ve left, so hopefully her fear has subsided and the two fillings go well. We have officially submitted the paperwork for Kenley to start VPK (voluntary pre-kindergarten) this fall and she will be at the same school. Realistically, not much will change for her, but a portion of the day is free, so Greg and I are excited about that part. She is currently evaluated four times throughout the year now in preschool and already been evaluated on the VPK standards this spring. You know how it is…all about the assessments and milestones. She does very well in school and absolutely loves it, so we are very happy about that. I’m not sure how, but sleeping has definitely gotten better with age for this girl. She willingly goes down for naps and for bedtime most nights. She can get by without a nap if needed, but sleeps hard when she does take a nap. She also will nap anywhere which she gets from her mama. If we are going someplace and we tell them they need to take a nap in the car, she’s in her car seat and has her eyes closed within the first 10 minutes. She also crawled into the stroller at Disney a couple weeks ago and went right to sleep. As long as she doesn’t fight taking a nap, we will offer her a nap, but I am also mindful of not letting her sleep too long during the day. She really will only be able to nap for another year or so, so we aren’t in a rush to drop it just yet. I hope she understands how awesome naps truly are and that she will miss them once she starts school. Her bedtime is 8:00pm and we are usually still pretty strict with that since she will get up at 6:30am the next morning no matter what time she goes to bed. The girl loves a schedule, I can tell you that. Her brother, on the other hand, will probably be done with naps when she is done with them. Happy half birthday Kenley Dee!